Is your dream vacation to visit Greece, ferry from Greek island to Greek island, see all the amazing sites, spend time on beautiful beaches, then this is the Greece singles vacation for you. Explore the Acropolis in Athens, drive around Mykonos island on a jeep safari, see the amazing sunset in Oia, Santorini and visit the ancient ruins of the Palace of Knosos in Crete. You will get to do all this and more on our Greek Island Dreams vacation - Plus spend time on beautiful Greek beaches. 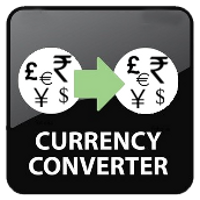 Arrive at Athens airport (**See Flight information below)and be met and transferred to the group's hotel, located around the corner from the Plaka, shopping and near all the ancient sites. 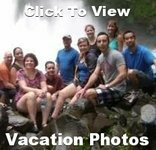 Our singles vacation begins at 3:00pm when we meet and greet with our tour leader and the other single and solo travelers for our private tour of the Acropolis. A leisurely 10-minute walk up the pedestrian walkway of Dionysiou Areopagitou leads to the Acropolis of Athens, crowned by the Parthenon with its spectacular views over the city below. 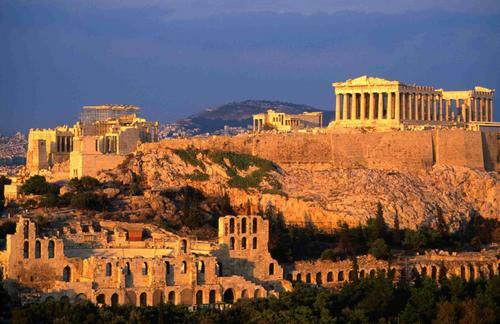 The Acropolis (Akropolis) means "city on a hill" and dates from the 5th century BC. Notable structures within the Acropolis include the Temple of Athena Nike, the earliest fully Ionic temple on the site, built between 427 and 424 BC. Tonight enjoy the nightly atmosphere of the Plaka as we dine at a local Greek restaurant. This morning we ferry through the Cycladic islands to the island of Mykonos, the jewel of the Mediterranean with beautiful beaches, chic boutiques and party night life. 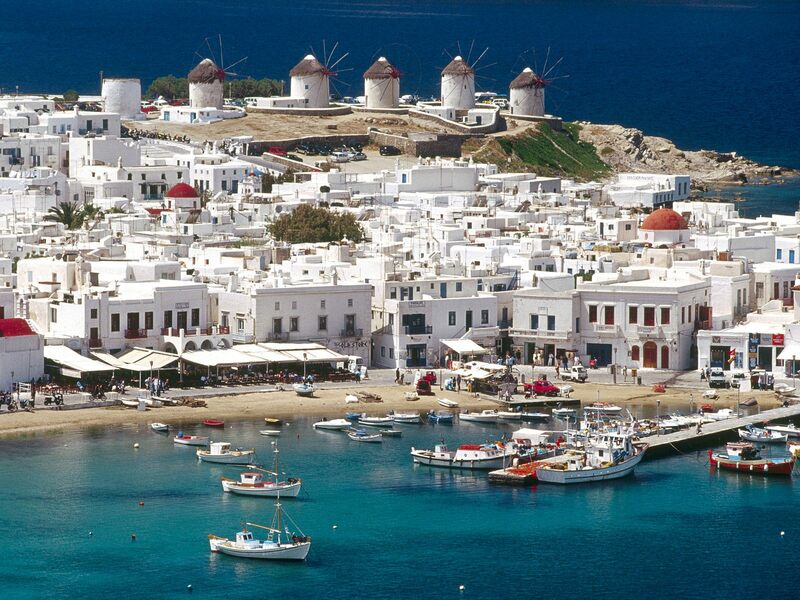 Hundreds of tiny chapels dot this blue and whitewashed island with its beautiful windmills and amazing sunsets. Upon reaching Mykonos we will be transferred to our hotel, check-in and get ready for a walking tour of Mykonos Town, also known as Chora. We will stroll the narrow cobblestone streets of a town that was designed so pirates would get lost. The early evening scene is centered on Little Venice where we can sip a cocktail at one of the many bars and cafes which are so close to the water's edge that our feet get soaked when a boat passes. We will watch the sunset at the most famous windmills in Greece and have dinner (not included) in one of the many cafes. Mykonos attracts a broad clientele - celebrities, politicians, the beautiful people and ordinary mortals all flock here to see and be seen at the glitzy "anything goes" clubs for which the island is now world famous. Today we get to see the hidden charms of Mykonos, enjoy breathtaking views, rural areas, beautiful beaches and the unique feeling of driving a jeep in Greece! We'll drive along Houlakia beach and see the lighthouse on the northwest side of the island, then through the region of Marathi, past the dam and Panormos beach towards the bay of Agios Sostis. The beaches here are totally secluded and far from the busy coasts of the southern side. We continue our drive to the Ano Mera region, a non-touristic village of Mykonos, stopping at the ruined Venetian Castle of Paleokastro. This region is agricultural and has an old, abandoned mine nearby. There will be time for lunch at a quaint seaside tavern. After lunch, we continue our drive along the southern coast past Kalo Livadi beach. Our next stop is Agrari Beach, where we have time for a refreshing swim before we return to our hotel. This morning we temporarily leave Mykonos for our excursion (weather permitting) to the neighboring island of Delos to visit the Temple of Apollo and other fascinating archaeological sites. We head to Mykonos Old Port to board our 30 minute cruise to Delos, the legendary birthplace of the Sun God Apollo and his twin sister Artemis. 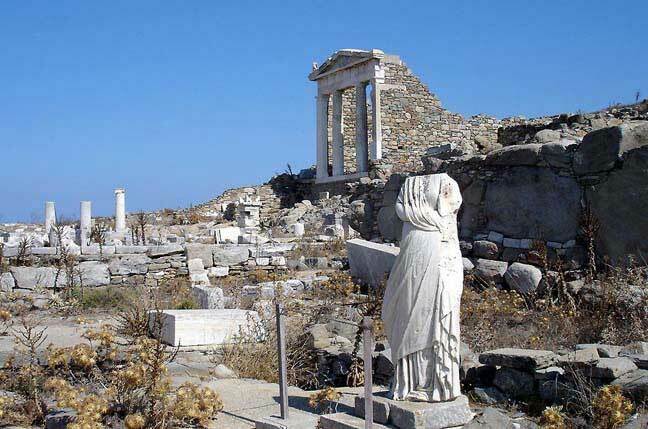 For 500 years, Delos was the religious and commercial hub of the entire Aegean, today, remains its treasured ruins. First see Agora and the Sacred Way, which leads to the Temple of Apollo. View the remains of a Hellenistic Quarter, harbor, water house, luxurious villas. If you're a beach lover and water enthusiast then you will love our afternoon adventure to the world famous PARADISE BEACH. Sand, sun, drinks, music, good food, fun & beautiful people best describe this hot spot. We will take the local bus to Paradise. No worries if you are not a sun-worshiper as there are lounges with umbrellas available for rent. Enjoy your last night in Mykonos by staying at the beach and partying all night or return to Mykonos town for dinner. Enjoy our final morning on this beautiful island. We leave Mykonos behind as we travel on an afternoon ferry to the island of Santorini, perhaps the most breathtaking of all the Greek Islands. 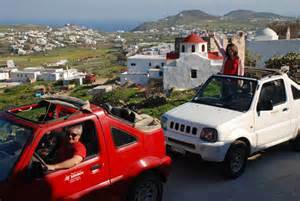 Gather your luggage as we disembark and are transferred to our hotel in time to enjoy a late afternoon and evening in the town of Thira. Our tour leader will guide us along the narrow streets to explore the white-washed houses, open-air cafes and glittering boutiques that cling to steep cliffs. The views are amazing so don't forget your camera. For those who want to go clubbing in Santorini, tonight is a great night to do so. Today we tour the island of Santorini and check out a few of the different beaches. Our first visit will be to Prophet Elias Monastery, founded in 1711 and built on the highest point of the island. From here the panoramic view of the entire island and the caldera is majestic. Then we stop at the famous Red Beach located by the village of Akrotiri. 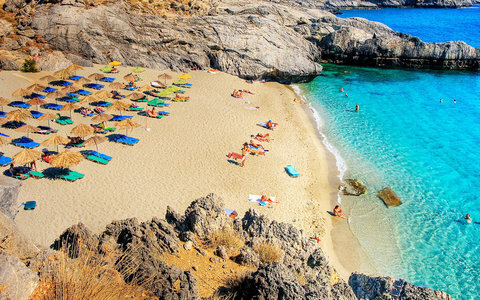 Then it's on to the black beach of Perissa where we can have lunch and swim before proceeding to the picturesque village of Megalohori with its typical traditional Cycladic houses and neoclassic buildings. Sunset in Oia is not to be missed! In the evening hordes of people arrive simply to watch its sunset. Every available seat, wall, step or patch of ground is occupied so our group will arrive in time to browse the tiny shops and get a good view. Our vacation continues as we board our ferry and cruise to Crete, the largest island in Greece, and the fifth largest one in the Mediterranean Sea. 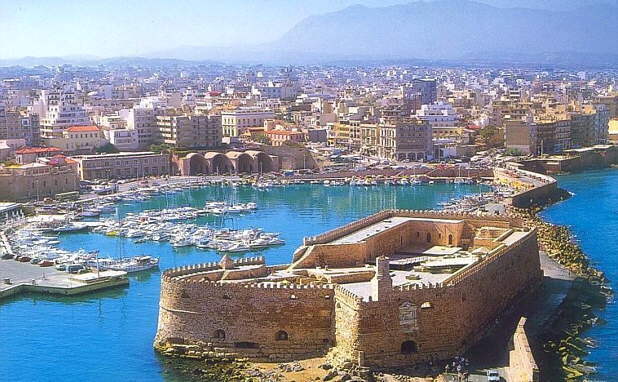 Arriving in the port at Heraklion we will see the Koules Venetian Fortress on the breakwater of the harbor, where it has stood since shortly after the Venetians conquered Crete in the early 13th century. 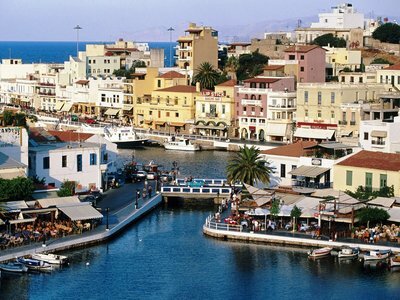 We will be met at the port and transferred to our Crete hotel. After checking in we will have time for beach and swimming before we go out exploring for the evening with our tour leader. 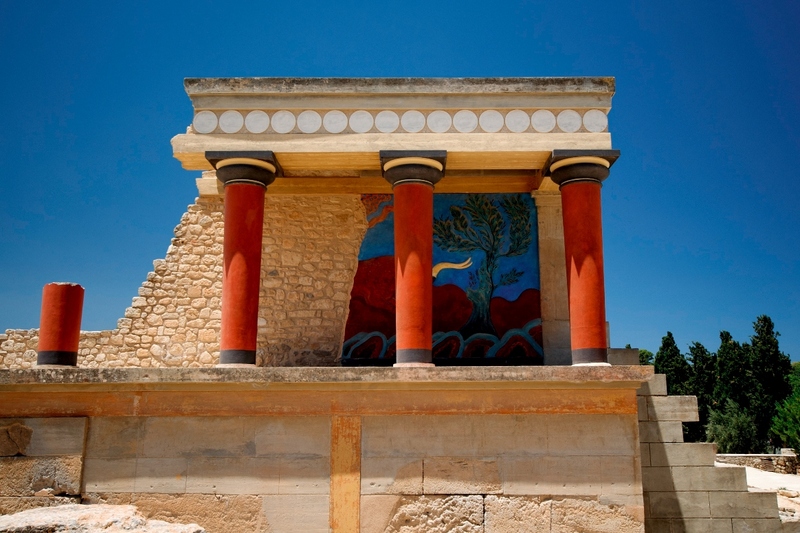 The center of the Minoan civilization was the Palace of Knossos, one of the island’s showstopping historical attractions. The original site is believed to have been built around 1900 BC, but following an earthquake, it was rebuilt on a grand scale, and lavish royal quarters, shrines, treasuries and storerooms were added around the Central Court. Hear the legends and Greek folklore while exploring areas of the palace like the Throne Room, home to frescoes of the Minoan’s sacred mythical beasts. Our guide will take us through the Central Court and gaze up at sights like the Grand Staircase. See an impressive fresco of rampaging bulls, and explore the corridors and labyrinth-like alleyways that lead to intriguing rooms such as the Theatral Area – a place that may have once existed as a theater. Let's visit the center of Heraklion town, surrounded by a formidable medieval wall, which was used to protect it from enemies. Maybe have a coffee, a Greek dessert or an ice cream in one of the many coffee shops/patisseries in Heraklion's main square. Or spend some time shopping, buy a designer outfit or a last minute souvenir - you may find a curio distinctly different from the typical "gift". There are so many sights to see and activities available on the island of Crete that today is your day to choose what you would like to do. The choice is yours!! Tonight we gather together for music, fantastic views and our Farewell Dinner.